Individually wrap and close products with the HW500 Hand Wrapper. Wrap Styrofoam and plastic trays. Preserves the food longer, extends the shelf life and deters pilferage at the point of sale. It also keeps products clean from dirt and impurities, thus enhancing the appearance. 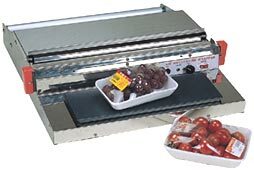 This wrapper has an electric heat blade that cuts the wrapping film from the roll. The heated PTFE fabric, non-stick plate assures a perfect and clean finish. The body of the AIE-HW500 is made of stainless steel for cleanliness. Complies with health department regulations. AIE-HW500 can take a roll of wrapping film up to 20 inches wide.